Article courtesy of NCWC Media - The Republican Reporter: Renee Shreve. Photo credit to Renee Shreve. 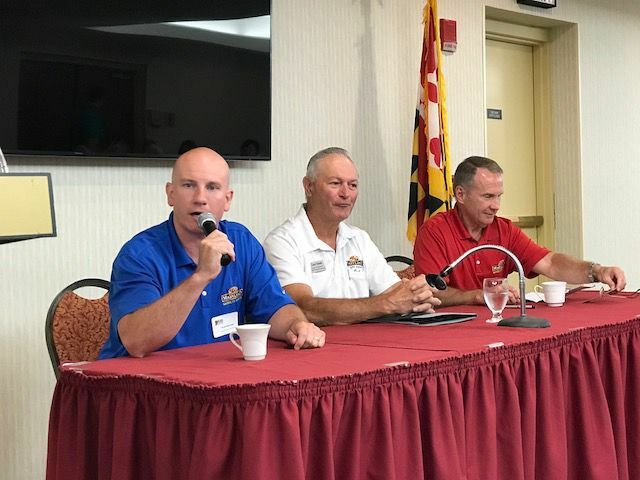 The state of Garrett County is “good,” Commissioner Paul Edwards announced Tuesday morning during the Chamber of Commerce’s monthly Business Before Hours at Wisp Resort. Representatives from about 70 local businesses and agencies attended the event, which included a breakfast and the Garrett County commissioners’ annual “State of the County” presentation. Edwards reported that the county’s Fiscal Year 2018 budget was recently approved. The new fiscal year began on July 1. Unlike past years, Edwards noted, the county was recently able to allocate funding to such capital projects as roads paving, Southern Middle School renovations, and Garrett College’s STEM (science, technology, engineering and mathematics) building. Grant funding has also been secured for local water/sewer systems. He stressed the importance of capital funding to support new businesses and jobs, entice young people to stay in the county, and increase economic development. He also reported that a local committee has begun interviewing candidates to fill the economic development director position, which was left vacant by Alex McCoy’s recent departure. Edwards said the county received 12 applications. Commissioner Jim Hinebaugh indicated there was no need to rush into hiring a new director. Hinebaugh, one of the department’s former directors, said he has agreed to “help out” in the interim. “I’m confident we’re not going to miss out on anything because we haven’t filled that position yet,” he said. Hinebaugh also reported that the county’s unemployment rate for this May was 4.5 percent. Last May it was 5 percent. “So, we’re 0.5 percent better than we were,” he said. The commissioner noted Garrett has fewer people unemployed people, 689 to be exact, than any other county in the state, based on an algorithm used by the Maryland Department of Licensing, Labor and Regulation. Overall, there were seven Maryland counties with higher unemployment than Garrett in May. He noted that several years ago, the county always had a big “upswing” in unemployment during the winter months. He also reported that the county is working with five prospective companies interested in locating to Garrett County. That does not include Grow West, a medical marijuana company that was eying property in Accident and Keyser’s Ridge. He stressed the need to expand the McHenry water system so that properties can be development in the Deep Creek Lake area, including Wisp Resort’s planned expansion. According to Hinebaugh, the county is currently at a stand still because it cannot issue any new water taps. Commissioner Larry Tichnell’s topics were education and the proposed Performing Arts Center. He noted Garrett is the only county in the state that does not have a center. Tichnell indicated education is the one of the county’s most important resources. He cited numerous achievements by local students in a wide range of activities, including sports, robotics and academics. “We excel in all of those areas,” Tichnell said. He noted, however, the county will face a challenge in FY ‘19 in funding the school system, and stressed the need to move forward with the children’s success, not backward. He said the local student population has decreased by about 300 since 2013, while the cost to education has steadily increased. In FY ‘13, the county spent $6,087 per student. In FY ‘18, the cost will be $7,508. Tichnell said the county’s education budget in FY ‘13 was about $26 million. In FY ‘18, it is a little over $27 million. “So if you look at these figures and the amount of income that’s coming in, it’s going to be a tough year in 2019 to totally fund everything our school board wants,” he said. To help plan for the future, the commissioners have asked the Board of Education and school officials to give them a five-year projection. Traditionally, Tichnell said, the BOE would come before the commissioners and ask for a certain amount of money for the coming fiscal year. This will help the commissioners plan their budgets in order to fund the school board to the best of their ability and continue to give local children the education they need, according to Tichnell. The chamber will hold its sixth annual Business & Industry Appreciation event on Tuesday, Sept. 19, beginning at 8 a.m. at Wisp Resort. Members can register online at visitdeepcreek.comusing their username and password.